It’s Friday. You know what that means. Date night…er..afternoon. J got home from work a little later than usual and hungrier than usual. I was ready for her. I had a web browser open with multiple menus. All of them sounded good to me, so it was up to her. 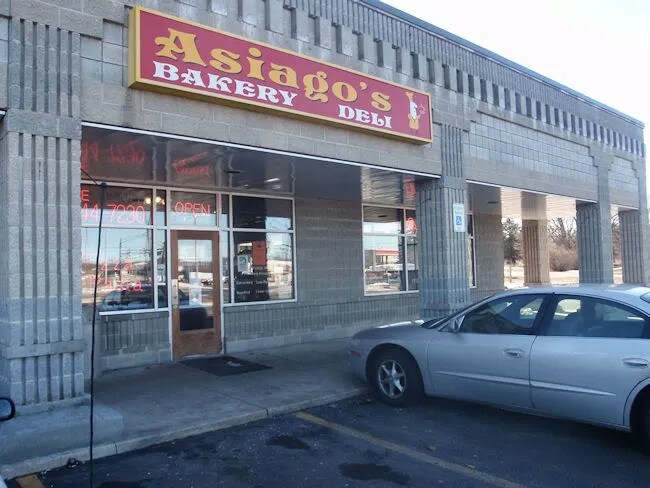 The menu she chose was Asiago’s Bakery & Deli on Q Avenue in Texas Township. We were just in the area last week when we went to dinner at Bold. We had a conversation as we were driving out of the parking lot that night that we should make it back to Asiago’s sometime. 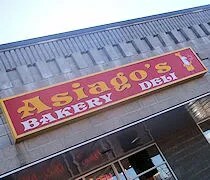 Asiago’s is in the same strip mall that Bold is in. It takes up a large corner space. The set up is more like a deli although there is a large dine-in space with booths and some pub tables. The space offers free wi-fi so it’s a good place to pick up a coffee and a pastry and get some work done. There is a large menu posted above the cash register and a pastry case. We started by looking at that one, but then noticed a paper menu. We picked one of those up which made it much easier to decide. The menu is full of sandwiches, soups, salads, and pizza. Pizza from a bakery. That always screams to me. I was going in that direction. J, however, went for a sandwich. J’s sandwich was the Herbed Tuscan Chicken Sandwich. 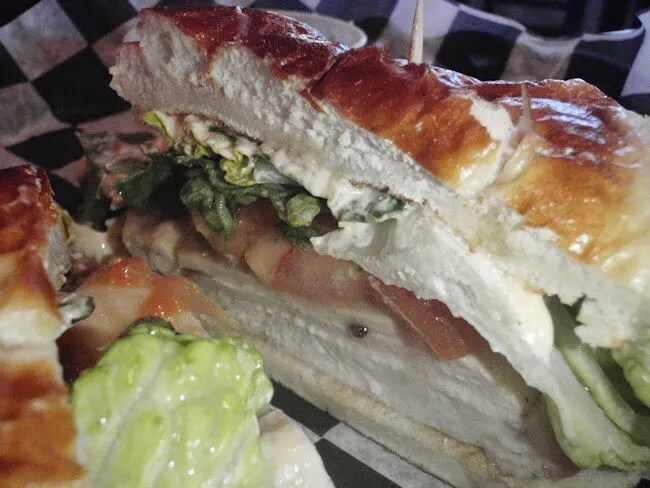 The sandwich has a lot going on. It’s a marinated chicken breast with chipotle mayo, Asiago cheese, tomato, onion, mixed greens, and a balsamic vinaigrette on a pretzel roll. J usually takes tomatoes off her sandwiches and this one was a little harder because the tomatoes were diced instead of whole. Not a huge deal. She also didn’t really like the vinaigrette. Not because she didn’t like the flavor but because it made the sandwich to wet. The bun and toppings were sliding off the meat because there was just too much liquid. Other than those minor complaints, she said the sandwich was delicious and really enjoyed it. The sandwich came with a bag of chips and a potato salad. I was given the bag of chips, but J also seemed to enjoy the potato salad. I knew as soon as I walked in the door what I was going to get. It’s a new menu item on the pizza menu. 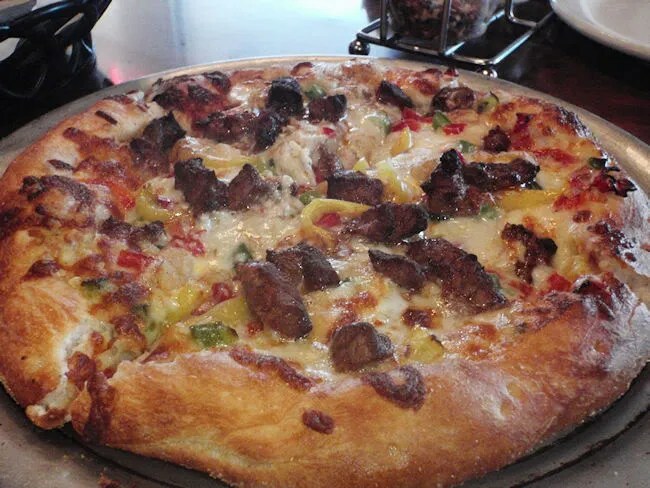 The Black-N-Bleu Steak Pizza is Cajun seasoned sirloin, bleu cheese, bell peppers, and an Alfredo sauce on an Old World Italian garlic thin crust pizza. I went with the small since I was eating this one alone. It seems like bakeries just get how to cook pizzas. The crust had a cornmeal dusting on the bottom and a crunch. It wasn’t dry and crunchy all the way through, but it did make a little snap when I bit through it. I was sort of questioning myself on ordering a pizza with bell peppers since they really aren’t my favorite, but they actually tasted good on this pizza. They weren’t overpowering and there were a few banana pepper rings thrown in there which added a hint of heat. 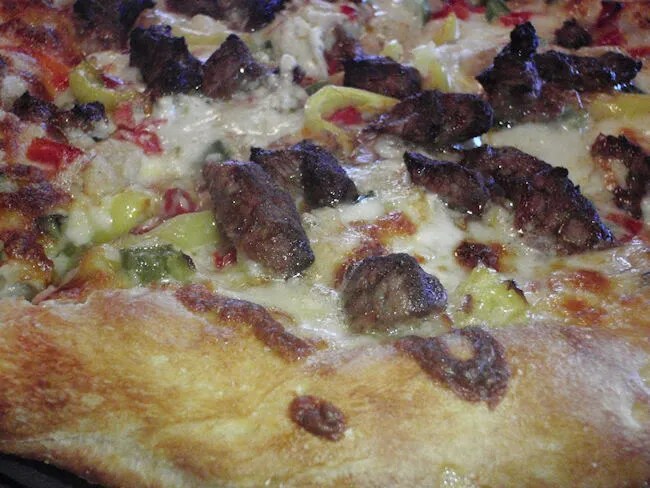 Bleu cheese and steak together is always a great combination and there was plenty of both. The weird thing about the meal is that J’s sandwich was brought to the table long before my pizza. J was actually finishing up her sandwich as my pizza was brought out so we had to sit there and watch each other eat. Not a huge deal, but a little uncomfortable. Would be really uncomfortable if I were dining with someone who’s not my wife. The total for the two meals including drinks was a little over $23. The pizza was $11 by itself. I would guess that’s because of the steak. We both really liked Asiago’s. They have a really great menu as well as a wide variety of baked goods and breads. They support local farmers which provides the freshest ingredients available. It’s one of those place that’s in a weird location, but worth the trip. Best pizza in Kalamazoo area! I love a crispy thin crust and they have it DOWN.